Olabisi Onabanjo University, P.M.B. 2002, Ago - Iwoye, Nigeria. Background and Objectives: Onychomycosis, a fungal infection of nails occurs worldwide with dermatophytes as the most common causal agents, although yeasts and moulds are also involved. The diagnosis usually involves direct microscopy and culture to prove actual existence of onychomycosis. This present study aims to provide knowledge of the epidemiology and mycological characteristics of onychomycosis involving toenails among rural farmers in a southwestern part of Nigeria. Methods: Direct microscopic examination using 20% potassium hydroxide (KOH) and mycological culture of 631 sub-ungual scrapings and toenail clippings from farmers suspected to have onychomycosis were prepared to identify the causative agents. Results: Trichophyton rubrum occurred as the predominant species of the total dermatophytes isolated (63.8%). The highest prevalence of individual etiologic agent was Trichophyton rubrum (16.9%), followed by Candida albicans (14.6%). One hundred and six non-dermatophyte moulds, of which Aspergillus niger and Fusarium moniliforme were the most frequent species (13.4% and 7.3% respectively) were also recovered from the specimens. Distal and lateral sub-ungual onychomycosis (DLSO) was the most prevalent clinical form occurring in 166 (63.6%) of the positive cultures followed by white superficial onychomycosis (WSO) in 51 (19.5%). Conclusion: The study revealed that dermatophytes and Candida species are involved in the pathogenesis of toenail infections among rural farmers in southwestern Nigeria. The occurrence of non-dermatophytic moulds should also not be ignored. Onychomycosis is a general term used for any fungal infection of the nail plate. This contrasts with the term tinea unguium which is specifically used for infection of the nails caused by dermatophytes. Zaias  divided onychomycosis into four clinical types; distal sub-ungual onychomycosis, which is the most common type of onychomycosis caused by dermatophytes, Candida species and miscellaneous mould and yeasts; proximal sub-ungual onychomycosis caused exclusively by dermatophytes and is the least common; white superficial onychomycosis; and candidal onychomycosis caused mainly by Candida albicans and non-albican species such as C. parapilosis, C krusei and C. gullermondii . Onychomycosis accounts for 50% of all nail disorders [3,4] with those affecting the toenails being 25 times more than that of the fingernails .They are mainly caused by dermatophytes. The dermatophytes commonly associated with onychomycosis include Trichophyton rubrum and T. mentagrophytes with the former occurring in up to 90% of cases [6,7]. Onychomycosis are caused, to a lesser extent, by moulds and yeasts. The moulds most frequently isolated from diseased nails are Aspergillus spp., Fusarium spp, Scopulariopsis brevicaulis, Scytalidium dimidiatum, S. hyalinum, Onychocola canadensis [8,9,10,11,12,13]. Reports in the literature revealed geographical differences in the epidemiology of onychomycosis. The clinical patterns of onychomycosis are changing because of the involvement of non-dermatophytic moulds. In Nigeria, most of the research work done on the superficial mycoses has been on the skin. There is paucity in the literature on reports on onychomycosis in Nigeria. The reports of Gugnani et al.,  and Greer  were the only reports in the literature known to the authors in Nigeria. Therefore this study was undertaken to investigate the prevalence of onychomycosis among rural farmers, who, through the authors interaction were observed to have conspicuous black pigmentation of toenails accompanied, in some cases, by painful inflammation and decay of underlying tissues, resulting in fall-off of the nails. This to the authors' knowledge is the first report in southwestern Nigeria documenting fungi from toenails of farmers suspected to have onychomycosis. The study was carried out in three villages located in Akinyele Local Government in lbadan, southwestern Nigeria between May 2002 and March 2006. Farmers, all of who were males between the ages of 25-67 years with discoloured toenails and sometimes with painful inflammation and decayed underlying tissues were included in this study. A total of 631 sub-ungual scrapings and toenail clippings were collected in separate universal plastic bottles (Sayag, France) after cleaning the affected areas with 95% ethanol and transported to the laboratory immediately after collection. Direct microscopic examination was carried out on the specimens by dissolving a portion of each sample in 20% potassium hydroxide (KOH) for 60 minutes to be examined under low and high power microscope for the presence of fungal elements such as hyphae, pseudo-hyphae, budding cells, spores or blastoconidia. Culture of all specimens irrespective of direct microscopy results was carried out on Dermasel agar (Oxoid), Sabouraud Dextrose Agar containing cycloheximide (Oxoid) and Dermatophyte Test medium (DTM) . The culture media were incubated at room temperature (28+ 20C) and examined daily for two weeks. The change of colour from yellow to red on DTM indicated the growth of a dermatophyte. Macroscopic and microscopic examinations of fungal colonies were carried out as follows. Wet mounts of moulds was carried out with Lactophenol cotton blue. The moulds were identified further according to the taxonomic schemes of Klich and Pitt  for Aspergillus spp, Nelson et al. for Fusarium spp. All Candida albicans isolates were examined for germ-tube production in human serum and for chlamydospores formation in corn-meal agar - Tween 80. Other yeasts species other than C. albicans were identified using their sugar fermentation and assimilation profiles. The morphology of the dermatophytes and other moulds as described by Al- Doory  were employed for their identification. Out of the 631 sub-ungual scrapings/nail clipping examined, 261 samples were positive for fungal growth. Mycological analysis showed the presence of two main genera of filamentous fungi, Aspergillus and Fusarium. The genus Fusarium was represented by three species, Fusarium oxysporum, F. solani and F. moniliforme. Four species of Aspergillus were identified which include Aspergillus niger, A. nidulans, A. terreus and A. fumigatus with A. niger being the predominant species. Other genera of fungi isolated were Cladosporium, Mucor and Penicillium. Candida albicans, C. tropicalis and Candida spp were the yeasts encountered while dermatophytes were represented by Trichophyton rubrum, T. mentagrophytes and Microsporum gypseum. T. rubrum occurred as the predominant (63.8%) of total dermatophytes isolated. Mixed cultures were obtained in 13 specimens. Fifteen fungal species remained unidentified. As shown in Table 1, the highest incidence of fungi isolated was the moulds (40.6%) followed by dermatophytes (26.4%) and then yeasts (22.2%). However, the highest prevalence of individual etiologic agent was T. rubrum with a total of 44 isolates (16.9%), followed by Candida albicans (14.6%), Aspergillus niger (13.4%), Fusarium moniliforme (7.3%) and T. mentagrophytes (6.5%). * % incidence of each isolate was calculated based on the total no. of isolates in each group. Table 2 shows the age groups of farmers studied. Onychomycosis affected all age groups with the highest frequency recorded for ages between 40-49 years. The ages of 21 farmers could not be ascertained. Table 3 shows the clinical forms observed in farmers with onychomycosis. Distal and lateral sub-ungual onychomycosis (DLSO) was the most prevalent clinical form and the commonest organism isolated from DLSO was T. rubrum followed by C albicans, A. niger and T. mentagrophytes var. interdigitale in that order. Discoloration of toe nails was seen mostly in subjects with DLSO. The majority of the farmers with white superficial onychomycosis (WSO) had T. mentagrophytes var. interdigitale and F. oxysporum as the causative agents with the former predominating (67%). Fig. 1 shows slide culture of Fusarium moniliforme isolated from toe nail samples. 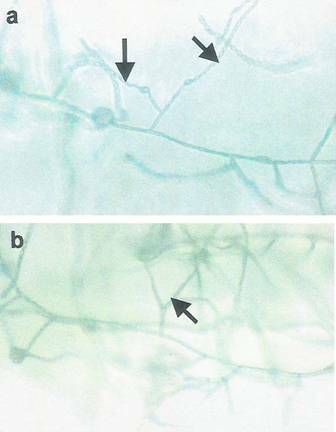 Fig 1: Long and short chains of microconidia of F. moniliforme on monophialides (a) as well as the branched monophialides of the fungus (b) on KCl medium. DLSO: distal and lateral sub-ungual onychomycosis; PSO: proximal sub-ungual onychomycosis; WSO: white superficial onychomycosis; TDO: total dystrophic onychomycosis. The results of this study showed that fungi of different genera were prevalent in the toenails of farmers investigated. Results obtained with direct microcopy did not correlate with the results obtained during culture in some cases involving moulds. This in not surprising because reports have shown that KOH preparations of specimens have up to 30% false-negative rates [19,20,21,22]. Among filamentous fungi, representatives of the subdivision Ascomycotina and Zygomycotina were isolated in decreasing order of frequency. The majority of the fungi isolated in the present study have been previously reported as etiologic agents of onychomycosis in different part of the world [23,24,25,26]. Baran et al. reported the causal significance of Fusarium spp. in proximal sub-ungual onychomycosis. In the present study, members of the genus was represented by three species, Fusarium oxysporum, Fusarum solani and F. moniliforme with F. moniliforme predominating. There has been no previous reports of the presence of F. moniliforme in onychomycosis in the literature. However, F. moniliforme has been reported as the most frequent of Fusarium spp. isolated in corn at different stages of development in the field and at harvest time and storage, being a soil-borne fungus [27,28] and in human food stuffs . It is not surprising therefore that it was one of the prevalent mycoflora found in toenails of farmers in the villages studied, since remains of maize plants after harvesting are usually ploughed to form part of soil, which is in contact with toenails. It is however difficult to determine the participatory role of this species in onychomycosis. The species was recovered in pure culture in 12 of cases of onychomycosis among the farmers and was recovered in mixed culture with C. albicans and T. rubrum in 4 and 3 cases respectively. The occurrence of Candida species is not surprising. Among the yeasts, Candida spp. has been reported in the literature as the etiologic agent of onychomycosis all over the world . Proximal sub-ungual Candida onychomycosis had been reported [9,31,32]. Lim et al  had earlier reported that 39% of the onychomycosis in Singapore were caused by Candida species. Results obtained in this study follow a similar pattern. Among the dermatophytes, T. rubrum had been previously reported to be the most common dermatophytes associated with onychomycosis [23,33]. T. rubrum has been reported to have great capacity to colonize the hard keratin of nails . In the present investigation, while T. rubrum was the most prevalent dermatophyte isolated, T. mentagrophytes and Microsporum gypseum were also recovered. T. mentagrophytes ranked second as the most prevalent dermatophyte isolated from the toenails. It also occurred in some cases in mixed culture with Candida albicans (9 cases) and Penicillium spp. (4 cases). The occurrence of the dermatophyte, M. gypseum (a keratinolytic fungus) in low frequency is expected. Although it is a geophilic species whose natural habitat is soil because of its saprophytic nature, it has also been reported to cause infections in the keratinous tissues of humans as well as domestic and wild animals  but has not been associated with onychomycosis. In this study, the most frequent clinical presentation was DLSO, a finding which is in consonance with earlier reports . The result of T. rubrum being the main etiologic agent recovered from DLSO followed by Candida albicans agreed with the reports of Alvarez et al. and Veer et al. . The results of the present study showed that T. mentagrophytes var. interdigitale was the most prevalent dermatophyte in WSO, which is in accordance with reports by Khosravi et al. and Gupta et al. . Fusarium spp. (F. oxysporum and F. solani) and A. terreus were also isolated in some cases of WSO. In proximal sub-ungual onychomycosis (PSO) without paronychia, C. albicans was the pathogen isolated in most cases (60%); in addition C. tropicalis, F.moniliforme and A. niger were recovered in 20%, 15%, and 5% of PSO cases respectively. One case of PSO was associated with F. solani. T. rubrum was the predominant isolate in 9 of the 16 cases of total dystrophic onychomycosis (TDO), with C. albicans and C. tropicalis in 4 and 3 cases respectively. Since all the subjects in this investigation were males, it was impossible to validate the assertion that onychomycosis is more common in females than males as reported in many literature. In this study the majority of the onychomycosis cases affected farmers of the age group of 40-49 years, an observation which agreed with that of Bokhari et al. . However there are conflicting reports on the age group affected in literature. The similarity in most clinical presentations for onychomycosis caused by moulds and dermatophytes makes it ultimately imperative to prepare cultures of causal agents for identification before any treatment could be prescribed. In all cases examined, lesions were observed mainly in nails of the big toes. Total nail destruction was seen in 4 cases of DLSO. The locations of study are rural areas where the presence of orthodox medicine is remote. Therefore most cases were treated with herbal therapy which was said to be effective (personal communication). Greer  reported that 10-50% of onychomycosis in Nigeria are caused by moulds. It is believed that the hot humid tropical and subtropical climate may be a factor responsible for the causative role of moulds. It is desirable to determine the prevalence of etiologic agents of onychomycosis in any particular area because of the geographical differences in the etiology and epidemiology of the disease in order to develop adequate control measures. Although most moulds such as Penicillium and Fusarium isolated in this study are part of the soil mycobiota involved in decomposition of dead plants materials and foliage, they have been reported as pathogens in immunocompromised patients. Other non-dermatophyte moulds species such as Scopulariopsis spp., Scytalidium spp. Onychocola canadensis, Acremonium spp., which had been reported by other investigators have not been identified in the present investigation. The precise identification of the unidentified isolates in the study is being carried out to foreclose this. Thanks are due to Chief A. Fakunle of Kole-Aroro, who made contact and accessibility to farmers and consent to collect specimens possible. 1. Zaias N. The nail in health and disease. 2nd edition , Appleton and Lange, Norwalk,1990. 2. Faergemann J. The role of yeast in onychomycosis. Mycoses 1996; 39: 223- 224. 3. Ghannoum MA, Hajjah RA, Scher A. A large scale North American study of fungal isolates from nails: the frequency of onychomycosis, fungal distribution and antifungal susceptibility patterns. J Am Acad Dermatol 2006; 43: 641- 648. 4. Murray SC, Dawber RP. Onychomycosis of toenail: orthopaedic and paediatric consideration. Australas J Dermatol 2002; 43:105-112. 5. Sobera J, Elewski B. Onychomycosis. In: Scher R.K, Daniel, C.R (editors). Nails:diagnosis, therapy and surgery . 3rd edition, Elsevier Saunders, 2005. 6. Lim JTE, Hock CC, Chee LG. Dematophytes and non-dematophytes onychomycosis in Singapore. Australas J Dermatol 33:159:163, 1992. 7. Elewski BE. Onychomycosis: pathongensis, diagnosis and management. Clin Microbiol Rev 1998; 11:415-429. 8. Sigler L, Congly H. Toenail infection caused by Onychocola canadensis gen.et sp.nov. J Med Vet Mycol 1990; 28: 405- 417. 9. Baran R, Tosti A, Piraccin BM. Uncommon clinical patterns of Fusarium nail infection: report of three case. British J Dermatol 1997; 136: 424- 427. 10. Gupta AK, Horgan- Bell CB, Summerbell RC. Onychomycosis associated with Onychocola canadensis: ten case reports and a review of the literature. J Am Acad Dermatol 1998; 39:410- 417. 11. Gupta AK, Ryder JE, Baran R, Summerbell RC. Non-dermagtophyte onycomychosis. Dermatol Clin 2003; 21: 257- 268. 12. Menotti J, Machouart M, Benderdouche M, Cetre - Sossah C, Morel P, Dubertret L. Polymerase chain reaction for diagnosis of dermatophyte and Scytalidium spp. onychomycosis. Br J Dematol 2004; 151: 518- 519. 13. Summerbell RC, Copper E, Bunn U, Jamieson F, Gupta AK. Onychomycosis: a critical study of technique, and criteria for confirming the etiologic significance of non-dermatophytes. Med Mycol 2005; 43:39- 59. 14. Gugnani HC, Nzelibe FK, Osunkwo IC. Onychomycosis due to Hendersonula toruloidea in Nigeria. J Med Vet Mycol 1986; 24: 239- 241. 15. Greer DL. Evolving role of nondermatophytes in onychomycosis. Int J Dermatol 1995; 34: 521- 524. 16. Al-Doory, Y. Laboratory Medical Mycology Lea and Febiger, Philadelphia, 1980. 17. Klich MA, Pitt JI. A laboratory guide to common Aspergillus species and their teleomorphs. Commonwealth Scientific and Industrial Research, 1994. 18. Nelson PE, Toussoun TA, Marasas WFO. Fusarium spp: An Illustrated Manual for Identification. The Pennsylvanica State Univ. Press, 1983. 19. Haldane DJ, Robert E. A comparison of calcoflour white, potassium hydroxide, and culture for the laboratory diagnosis of superficial fungal infection. Diagn Microbial Infect Dis 1990; 13: 337-339. 20. Baran R, Chabasse D, Feulihade de chaurin M. Les onychomycosis. II - Approche diagnostique. J Mycol Med 2001; 11: 5- 13. 21. Carballo MG, Roderguez NA, Peralta NB, de Cabalier ED. Application of direct flourecence technique in the diagnosis of superficial mycosis. Rev Fac Cien Med Univ Nac Cordoba 2002; 59: 57- 61. 22. Weinberg JM, Koestenblatt EK, Tutrone WD, Tishler HR, Najarian L. Comparison of diagnostic methods in the evaluation of onychomycosis. J Am Acad Dermatol 2003; 49: 193- 197. 23. Basnerjee U, Seth M, Pasricha JS. Study of onychomycosis in India. Mycoses 1990; 33: 411- 415. 24. Brilhante RSN, Cordeiro RA, Medrano DJA. Onychmycosis in Ceara (Northeast Brazil). Epidemiological and laboratory aspects. Men Inst Oswaldo Cruz 2005; 100: 131- 135. 25. Dogra S, Kumar B, Bhansali A, Chakrabarty A. Epidemiology of onychomycosis in patients with diabetic mellitus in India. Int J Dermatol 2002; 41: 647- 65. 26. ElSayed F, Ammoury A, FeghalyHaybe RA, Dhaybi R. Onychomycosis in Lebanon: a mycological survey of 772 patients. Mycoses 2006; 49: 216. 27. Chulze SN, Ramirez ML, Farnochi MC, Pascade M, Visconts A, March G. Fusarium and Fumonisins occurrences in Argentinian corn at different ear maturity stages. J Agric Food Chem 1996; 44: 2297- 2307. 28. Farnochi MC, Etcheverry M, Dakero A, Chuzle S. Fusarium (section Liseola) and fumonisins in storage corn from Argentina. Cereal Res Communic 1997; 25: 587- 589. 29. Bullerman LLB, Tsai WJ. Incidence and level of Fusarium proliferatum and fumonisins in corn and Corn -based foods. J Food Prot 1994; 57: 541-546. 30. Koussidou T, Devliotou-Panagiotidou D, Karakatsanis G, Minas A, Mourellou O, Samara K. Onychomycosis in Nothern Greece during 1994-1998. Mycoses 2002; 45: 29- 37. 31. Dorko E, Jautova J, Tkacivoka L, Wantroubova A. The Frequency of Candida species in onychomycosis. Folia Microbiol (Praha) 2002; 47: 727-731. 32. Ellabib MS, Agaj M, Khalifa Z, Kavanagh K. Yeasts of the genus Candida are the dominant cause of onychomycosis in Libyan women but not men: result of a 2-year surveillance study. Br J Dermatol 2002; 146: 1038- 1041. 33. Midgley G, Moore MK, Cook JC, Phan QG. Mycology of nail disorders. J Am Acad Dermatol 1994; 31: 568- 574. 34. Hay RJ. Onychomycosis. Dermatol Clin 1993; 11(1): 167. 35. Dermage C, Contet-Audonneau N, Kombila M, Miegevlle M, Berthonmeau M, Devroey C, Percebois G. Microsporum gypseum complex in man and animals. J Med Vet Mycol 1992; 30: 301- 308. 36. Romano C, Gianni C, Difonzo EM. Retrospective study of onychomycosis in Italy: 1985-2000. Mycoses 2005; 48: 42- 44. 37. Alvarez MI, Gonzalez LA, Castro LA. Onychomycosis in Cali, Colombia. Mycopathologia 2004; 158: 181- 186. 38. Veer P, Pawardhan NS, Damle AS. Study of onychomycosis: prevailing fungi and pattern of infection. Indian J Med Microbiol 2007; 25: 53- 56. 39. Khosravi AR, Aghamirian MR, Mahmoudi M. Dermatophytoses in Iran. Mycoses 1994; 37: 43- 48. 40. Gupta AK, Ryder JE, Summerbell RC. Onychomycosis: classification and diagnosis. J Drugs Dermatol 2004; 3: 51- 56. 41. Bokhari MA, Hussain I, Jahangir M, Haroon TS, Aman S, Khurshid K. Onychomycosis in Lahore, Pakistan. Int J Dermatol 1999; 38: 591- 595.